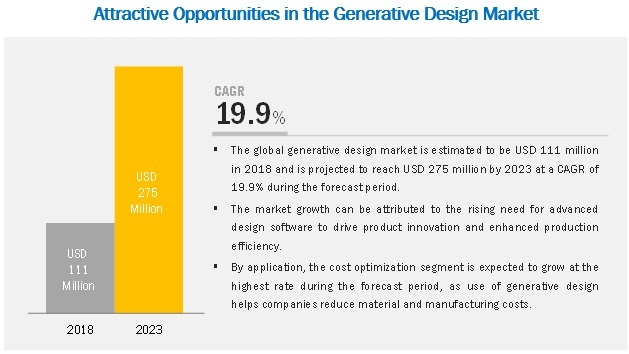 [105 Pages Report] The generative design market size is expected to grow from USD 111 million in 2018 to USD 275 million by 2023, at a CAGR of 19.9% during the forecast period. Factors such as rising need for advanced design software to drive product innovation, growing demand for environment-friendly architecture, and enhanced production efficiency are expected to the drive market during the forecast period. 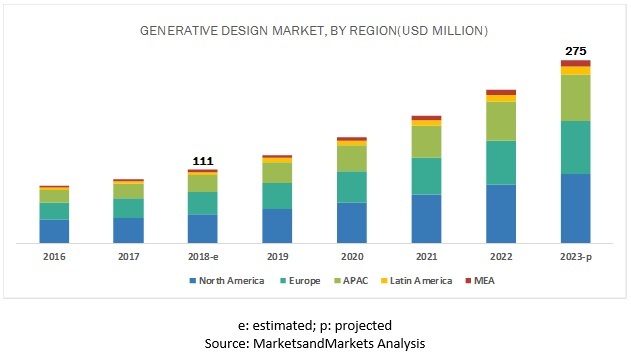 The generative design market study aims at estimating the market size and future growth potential of the market across segments, such as component (software and services), application, deployment model, industry vertical, and region. By component, the generative design market is segmented into software and services. Software that automatically produces optimum forms or products and buildings are considered in this market. This software is set to transform the role of designers and engineers, drastically reducing manufacturing time. This software is gaining traction from the manufacturing and construction sectors to cut costs of operations. With the advent of AI, generative design has gained popularity among engineers and architects as it provides thousands of design suggestions guided by a number of constraints such as weight, load, cost, and material. Designers and engineers can filter through these suggestions and opt for the best-suited outcomes. Generative design finds major application in product design & development, helping companies achieve lower part-consolidation costs, improve product strength, and simplify supply chains. On-premises deployment of generative design software provides organizations the ownership of their own data, business processes, and internal policies, and helps them manage risks and adhere to external compliance requirements. The growth of this segment can be attributed to the flexibility it offers to customize software as per an organization’s dynamic requirements, data security, and privacy. The global generative design market, by region, covers 5 major regions: North America, Asia Pacific (APAC), Europe, the Middle East and Africa (MEA), and Latin America. North America is expected to lead the market during the forecast period due to the presence of a large number of solution vendors in the US. The generative design market comprises major solution providers, such as Autodesk (US), Altair (US), ANSYS (US), MSC Software (US), Dassault Systèmes (France), ESI Group (France), Bentley Systems (US), Desktop Metal (US), nTopology (US), and Paramatters (US). The study includes an in-depth competitive analysis of these key players in the market with their company profiles, recent developments, and key market strategies. In January 2019, Autodesk has collaborated with HP and GE to develop generative design software tools compatible with 3D printers. This would help Autodesk to increase rapid prototyping for 3D-parts. In August 2018, Desktop Metal launched an updated version of 3D printing generative design software tool, Live Parts. The tool provides design engineers with enhanced design flexibility and light-weighting capabilities through advanced simulation and morphogenetic values. In December 2017, nTopology raised USD 7.6 million led by Data Collective, and Root Ventures in its equity funding round. This funding would help nTopology enhance its generative design software. What are the opportunities in the generative design market? What are the emerging technologies impacting the overall market? What are the key use cases existing in the market? What are the key trends and dynamics existing in the market? *Details on Business Overview, Software and Services Offered, Recent Developments, SWOT Analysis, and MnM View Might Not Be Captured in Case of Unlisted Companies. The study involved 4 major activities to estimate the current market size for generative design software and services. Exhaustive secondary research was done to collect information on market, peer market, and parent market. The next step was to validate these findings, assumptions, and sizing with the industry experts across value chain through primary research. Both top-down and bottom-up approaches were employed to estimate the complete market size. Thereafter, market breakdown and data triangulation were used to estimate the market size of segments and subsegments. In the secondary research process, various secondary sources, such as Hoovers, Bloomberg BusinessWeek, and Dun & Bradstreet, were referred for, to identify and collect information for this study. These secondary sources included annual reports; press releases and investor presentations of companies; white papers, certified publications, articles by recognized authors; gold standard and silver standard websites; manufacturing design technology Research and Development (R&D) organizations; regulatory bodies; and databases. The market size, in terms of value, were determined through primary and secondary research processes. This research report categorizes the generative design market based on application, component, deployment model, industry vertical, and region.